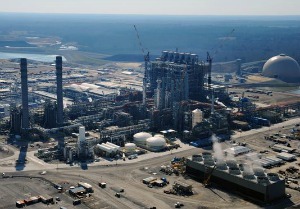 JACKSON – Mississippi Power Co. is telling regulators that the company wants bill credits to be the default option when refunding the $350 million the company collected from customers for its Kemper County power plant. Submitted photo: Mississippi Power has filed three requests for rate increases to pay for the $6.2 billion Kemper power plant. only wants to issue checks when customers ask, although it acknowledged the three-member commission could order the company to issue checks to all customers who are due a refund. “A default option is necessary to prevent a requirement that all 188,000 of MPC’s customers contact the company prior to receiving a refund in any form,” the company wrote in the filing. The company cut rates 18 percent Monday after the state Supreme Court ruled in February that the 2013 increase for the $6.2 billion plant was illegal and ordered refunds. Any rate decrease could be short-lived. Mississippi Power sought to increase rates after the court ruling, and the PSC has scheduled a hearing on the request at the same Aug. 6 meeting that commissioners intend to vote on the refund plan. The utility says it is short on cash and will have to obtain money for the refunds, probably from Southern Co.
Mississippi Power wrote that because of turnover in its customer base, as many as 300,000 current and former customers are due a refund. The company estimates that a residential customer who uses 1,000 kilowatt hours per month of electricity and has been served since the rate increase began in April 2013 is owed about $650. Until Monday, that customer paid about $144 a month. However, average residential customers use more power, and thus would be owed more.